Sometimes you need a truck to do a man's job. It might be that you've got a haul a few redwood tree trunks around your sprawling estate, or much out an elephant's stable, but these aren't jobs you can do in some old Yota pickup or a modern crossover. You need something ridonkulous...like this 1995 Range Rover Classic currently bidding here on eBay for $2,550 reserve-not-met with $7,500 buy-it-now, located in Sandy, UT. The Range Rover classic is a formidable off-roader in its own right, but install the legs of a Mercedes-Benz UniMog (short for Universal-Motor-Gerat) and you've got a recipe for manly stuff. This Range Rover now has enough ground clearance to drive over upright propane bottles...if you are into that kind of thing. The car uses its original 3.9 liter Rover V8, but the transmission is now a Chevrolet 700R4 auto with transfer case, mated to independently lockable hubs front and rear. 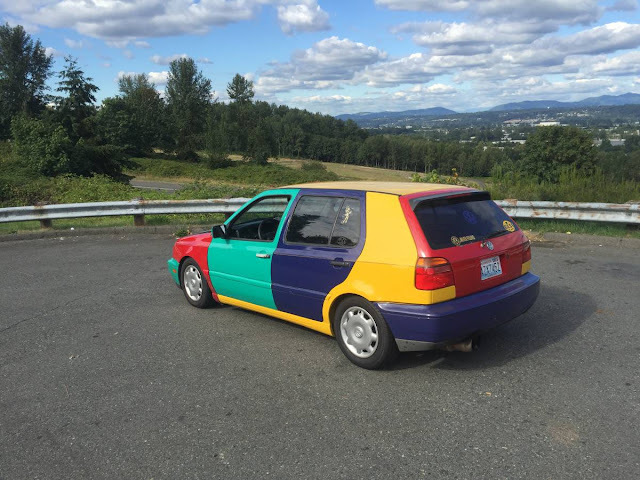 Per the seller, the car does have some problems, including a slipping transmission and an engine that doesn't want to start...plus the interior looks like its been driven by a porcupine. If we were still doing song matches, that propane bottle photo would make me suggest "Come on baby, light my fire". That would be a suitable ending to this beast. But wait, in addition to the Humvee and Rover-zilla, the guy also has a Corvair under the car port. I think we need an intervention to save the Corvair before this guy fires up the cutting torches again. I don't think there's ever an appropriate time to stop doing song matches. Probably the best thing to do with older Rovers. As parts fall off, modify, weld, rig, and spray with rhino liner. Much too difficult to keep these in perfect shape.